A packed out Ginasio Mauro Pinheiro in Sao Paulo, saw some thrilling action on the 1st of November with the last of the initial EFN Champions league tournaments, deciding the final contestant to go through to the final big 4 man tournament set for the 5th of December. The first semi final saw two Sao Paolo natives do battle for a place in the final and local bragging rights. Ricardo Pacheco faced off against Ravy Bruno Lopez and it was clear from the opening bell that Lopez had come for a war, as he rushed across the ring and sent Pacheco flying over the ropes in the opening minute of the fight. Outside of his aggression though Lopez came up a little short in the technical department, relying a little too much on his punches, whereas Pacheco played a much smarter game, picking off the onrushing Lopez with sharp kicks and managed to score well in the clinch. Lopez put up a fast pace throughout, but it was Pacheco’s slick countering that was the difference between them and Pacheco moved through to the final. 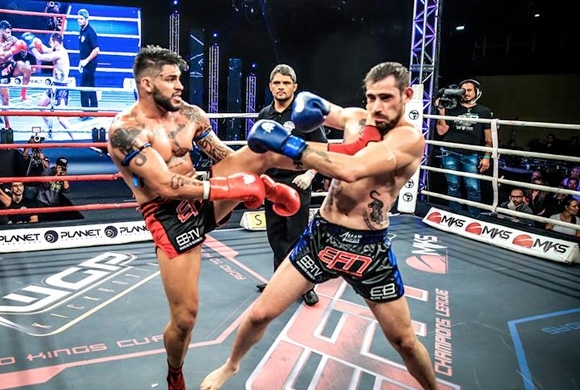 The second semi final saw Willian Silva take on another local Sao Paolo fighter, the experienced veteran Alex Oller. You could tell straight away that Silva was not intimidated by the experience and reputation of Oller though as he marched forward throughout the opening round and engaged Oller in the clinch with solid knees. Oller came in with a few punches and elbows, but Silva looked strong. Oller started the second round looking more determined and opened up with some sharp punches. Silva was a little slower in getting forward at first, looking to score with sharp kicks, but in the second half of the round looked strong again in the clinch. In the final round Silva looked to wear down Oller again with more strong clinching and solid knees. Oller managed a few punches, but nothing really bothered Silva who took the points win to move into the final. The opening round of the final mirrored both fighter’s previous bouts, with Silva walking forward throughout and Pacheco looking to move back more and look to counter. In round two the fight moved into the clinch with both looking sharp early on. Silva slowly got on top though with a relentless work rate of knees. The final round saw both lock horns again in the clinch, but with a few more elbows thrown into the mix as well. Pacheco managed to open up a small cut on Silva’s left eyebrow, but again it was Silva’s work rate and strong knees that caught the judges eyes and he took the decision to be crowned Champion and earn his slot in the 5th of December final.